Small Hand Carved Ganesh Gemstone Carving. 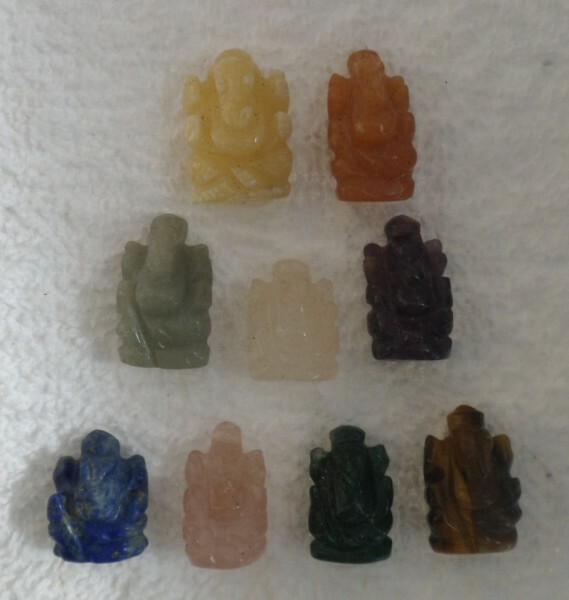 This is a special assortment of small hand carved gemstone Ganesh. These Ganesh range from approx. 2cm - 2.5 cms high. Price is for one gemstone Ganesh. Ganesh or Ganesha is also known as Ganapati and Vinayaka and is one of the best known and worshipped deities of the Hindu Pantheon. His image can be found throughout India, Sri Kanka and Nepal. Ganesha is depicted with an elephant's head and is known as the remover of obstacles, the patron of arts and sciences and the deva of intellect and wisdom. Please Note: As stock constantly changes the Genesh shown might not be available but we will send you a Ganesh very similar.